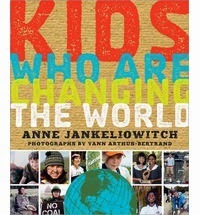 "The inspiring stories of 45 young heroes who have made an impact on our planet. Forty-five young people from around the world (including twelve from the U.S. and four from Canada) are doing something every day to make the world a better place. They discovered issues that concerned them and did something about it. With skills ranging from singing, drawing, and painting to fund-raising, public demonstrations, and events, they have fought climate change and pollution, and worked to protect animals and their natural habitats. This inspiring book also includes reference materials and suggestions on how readers can get involved." In Washington, it seems that nothing is getting done about finding solutions for global warming. With Democrats and Republicans at a stalemate, decisions that will affect our future are not being made, and we, the people, are going to suffer because of it. In the chaos of constant criticism and debate regarding global warming and climate change, sometimes the best voices to listen to are the most innocent. Here are forty-five children who are trying to make a difference with our environment, which includes everything from pollution to animal endangerment. These awesome kids step forward to provide solutions to our most pressing environmental issues. Each young person is given the chance to express his/her beliefs about the topic and possible solutions to the problem. With breathtaking photography to colorfully illustrate what is at stake, these forty-five brave young people try to change the world. Will you listen?